Gaynor Minden was established in 1993 and quickly earned itself a reputation as a bit of a ballet rule breaker. While the original Gaynor’s were build with stiff shanks, they now offer a huge range of pointe shoe options including ultra flexible shanks, boxes, narrow heels, longer sizes, built in suede tips etc. 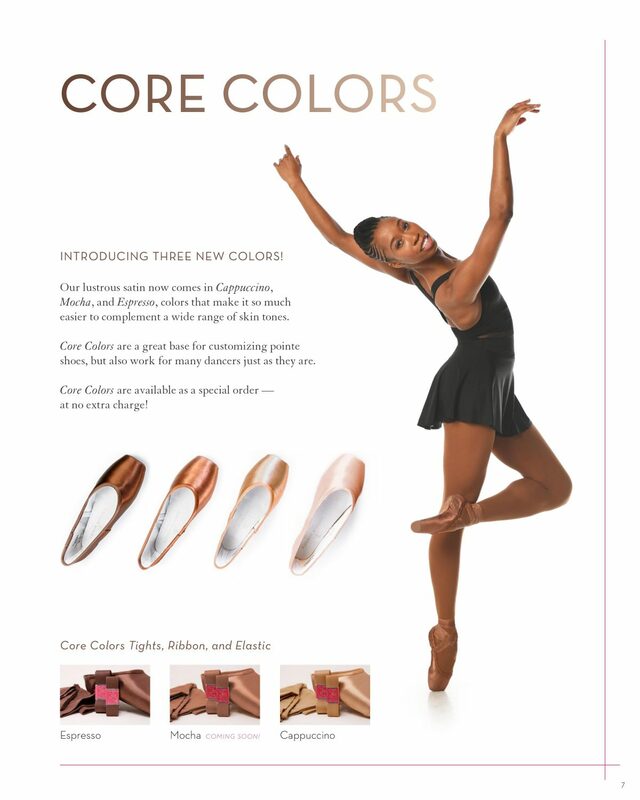 They have also come to the table with the release of their ‘core colors‘ pointe shoes in the colours ‘cappuccino’ and ‘espresso’ – which are available at no extra charge! Gaynor’s are highly customisable – there’s around 8,000+ sizes, with various options for style, box size, width, vamp and heel height, lengths up to a women’s 12.5, and five different shank densities to choose from. Although many dancers used to think Gaynor Minden only made stiff shoes – they actually offer shanks that compare to a brand new, un-broken in shoe, all the way to the softness of a “dead” pointe shoe, all while lasting longer than traditional shoes, due to their patented technology. They’re great for any dancer, beginner to professional. Because every shoe (and every dancer) is different, you will need to make sure you have the right fit when buying these shoes. To that end, you can email, phone or event WhatsApp Gaynor Minden – all the details are on their page. The next colour to be added to their FleshTone collection will be ‘Mocha’. A slightly more milky brown that is going to suit many dancers who are still out in the wilderness when it comes to pointe shoes. Matching ribbons, elastic and tights are also available for all of the Core Colors. We are definitely Gaynor Girls at FleshTone.net! Prices start from $120USD with ribbon and elastic extra.